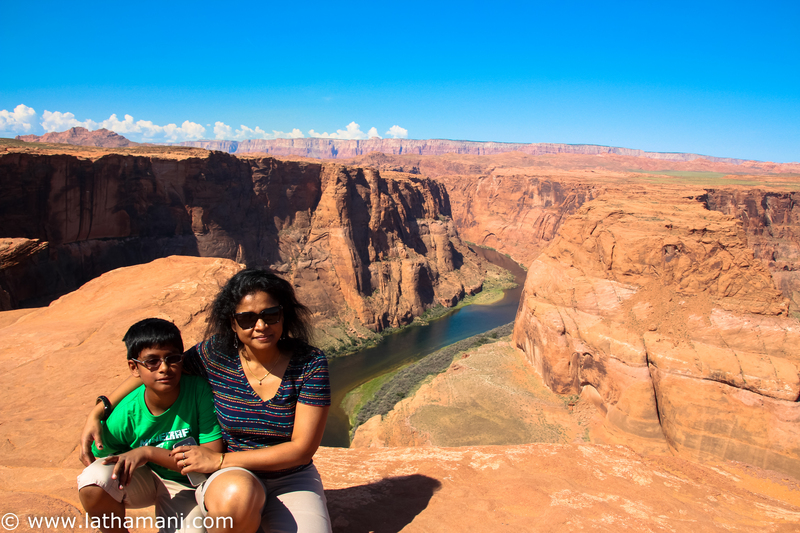 Horseshoe Bend is one of the must-see places in my travel checklist for quite sometime after seeing some beautiful photographs from my travel blog friends. We decided to do a short 5 day trip to the Canyons in Arizona and I didn’t want to miss Horseshoe Bend to the travel schedule. You will probably need less than 2 hours to spend at this beautiful place and if you have a passion towards photography, you would want to spend more time to capture the beautiful moments both at sunrise and sunset times. Horseshoe Bend is located about less than 3 miles south of Page, Arizona on Hwy 89 and it’s very easy to miss the location. We missed it very first time and came back to our hotel to get the closest directions. As you head south on Highway 89 there is a signboard for Horseshoe Bend between mile marker 545 and you will need to take a right turn that will take you to the parking lot. 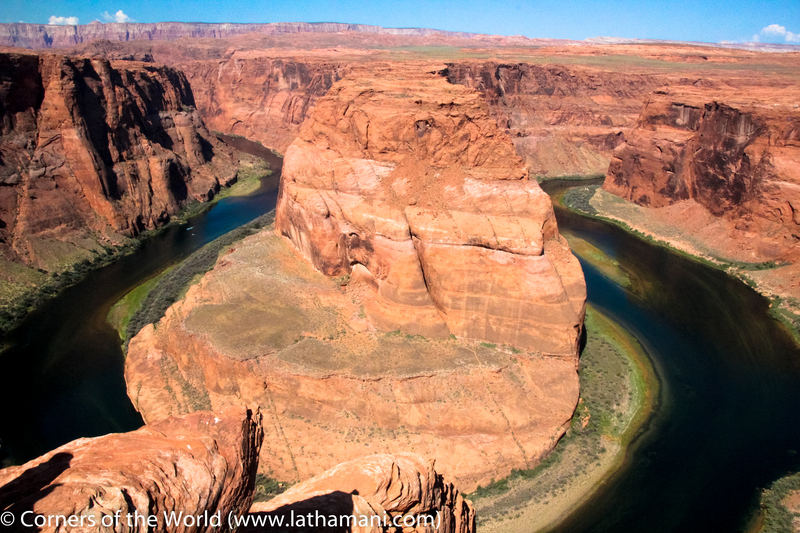 You will need to hike around 1 mile from the parking lot to view the Horseshoe bend. The hike is a moderate one and has very good maintained trail pathways. 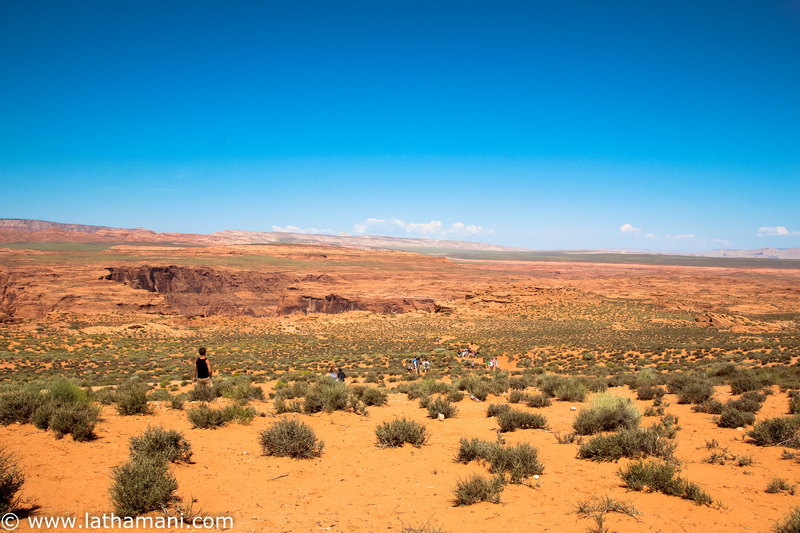 The trail consists of desert sand and has slightly up and down elevation and depending on the time of your hike, it can slightly become tiring if you don’t carry enough liquids with you. When you get to end of the trail, you will experience the magnificent overlook of Colorado river that makes close to 360 degree bend. The colors of the canyon are amazing to watch especially with different shades of sunlight touching the walls of the canyon. The Colorado river flows from right side of the view around the bend and makes an exit to the left. The overlook is at the top of a steep cliff that runs several thousands of feet high. The orange rock is the sandstone and is supposed to the largest sandstone layer in the United States. 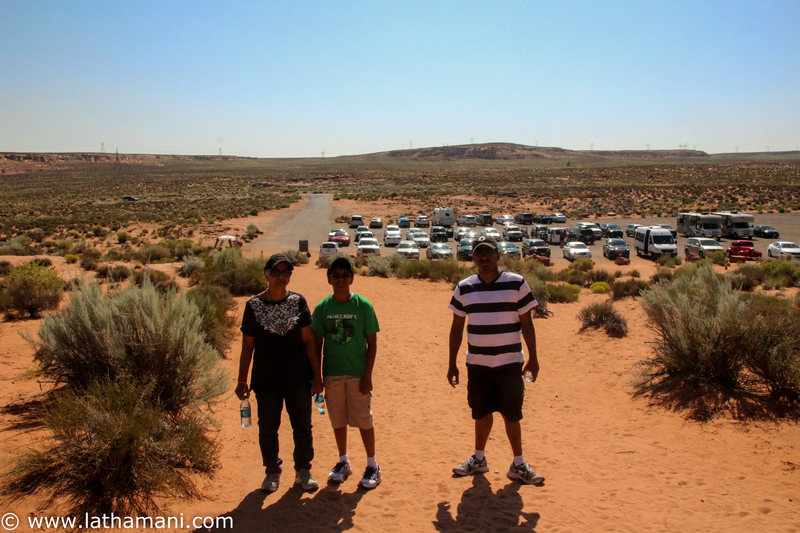 We learnt that this area is composed of sand dunes from the early age of Jurassic and stretches from Arizona to Wyoming. There were advisory sign boards to hike carefully to the Horseshoe Bend area as the exposed rock on the top and sides are not very strong and chances that the rock could break at anytime. Please be careful not to stand on the edge or trying to do any kind of climbing. It’s a very beautiful place but at the same time safety is important and enjoy the views staying few distance apart. Overall the hike itself took us only 15-20 minutes long and the rest of the time spent in capturing photos and videos. The entire area looks like a desert and there are no public rest-rooms available in that area. Please carry water, sunglasses, hats and plenty of sunscreen. The temperature varies and be prepared with the weather conditions by planning ahead.